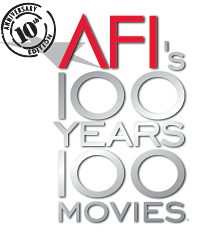 The American Film Institute released the second version of their 100 Years...100 Movies list on June 18, 2007 almost nine years after the original list. It presents 100 of the greatest American movies, as selected by 1,500 scholars and filmmakers. This version also includes some movies released after 1997, with many of the original entries either rearranged or even replaced—very few films that reappeared on the list retained their previous spot. The complete list can be found here , the list of the 400 nominees here , and a comparison to the original list here .